This is easy to use, easy to apply and slow drying for a texture (about 4-5 minutes a coat). It's a pretty black texture with red glitter. It was really easy to apply. Lasted well but did notice tip wear on my left index finger - no where else though! Que unhas maravilhosa amei a cor. 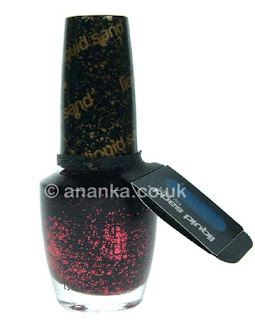 Funny thing, I was wearing black today on my nails and I wear it rarely ;) This one reminds me of one OPI of the Coca-Cola collection, but they both have different finishes. This sandy is interesting! What was its name, btw? Totally not my cup of tea, but looks ok on you. I like how much the glitters stand out from the black base! It's so lovley, but unfortunately one of my fails. It didn't want to dry at all. May be, I'll try again? I love the look, great mani. Perfect for the upcoming season. Lovely blog here btw! Would you like to follow each other on GFC? Please let me know on my blog so I can follow back. Thank you. Wow es alucinante, me encanta ese esmalte, hipnotiza!! I'm in love with it, black and red is an amazing colour combo.